A haunting rising and falling “ker-loo-ee” whistle. 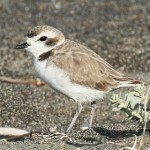 In breeding plumage, black around eye extends down onto throat and belly. White stripe across forehead, crown, nape, and down sides of breast. Undertail coverts also white. Back mottled black and white. 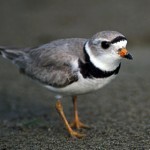 In winter plumage and juveniles, mottled gray above and pale, lightly streaked below. In all plumages, white wing stripes and black underwing patches are visible in flight. 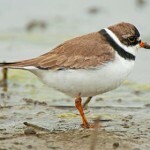 Habitat: Migrants found on mudflats, shorelines, and plowed fields. Where in Nebraska: Uncommon spring and occasional to rare fall migrant in eastern part of state. Less common westward. Field Notes: Nests in the arctic tundra. 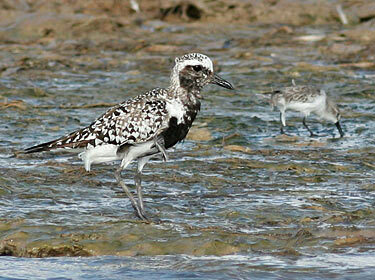 Fun Facts: Black-bellied Plovers are especially wary and tend to take flight event when a threat is still far away.